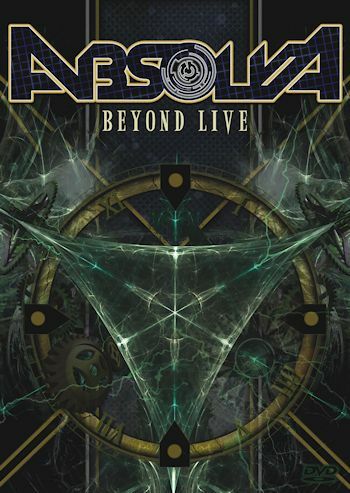 Absolva have unleashed a “Fan Pack” containing a live cd and dvd, ( though these can be ordered separately ) recorded at the band’s sell-out headline show at Wizzfest, Belgium earlier this year. On the strength of this dvd alone, this british metal trio comprising of Chris Appleton – lead vocals & lead guitar, Martin McNee – drums, Dan Bate – backing vocals & bass seriously kick some arse on this live dvd. For those who may not have followed Absolva’s progress, they originally started out as a quartet, with Tom Akinson on 2nd lead guitar, however he left shortly after this video was shot. They have remained a trio despite advertising the vacant 2nd guitarist’s slot, and after seeing them play on the Queensryche bill in Manchester last month, they are more than capable and seem happy staying this way, only time will tell if they do recruit another guitarist. After a brief intro the title track of the band’s debut album ‘Flames Of Justice’ rips open this concert with a vengeance, with Chris really driving this song along with some massive riffage, and Dan’s pounding Bass. There’s no rest as the band power straight into ‘100 years’ before Chris takes the mic and says “Hello Wizzfest” a welcome cheer from the sell-out crowd show the band they are doing the right thing. And so they power on, playing nearly the whole of the band’s debut album “Flames Of Justice “. Two new songs are on here, ‘Killing Season’ and ‘Some Wild Universe ‘, so this is your chance to hear them first, as they will be on the new album due out early next year. Drummer Martin Mcnee had just over 3 minutes in the spotlight to show the crowd that he can drum with the best of them, and he certainly entertains, even getting a roar of approval from the crowd, not bad going for a drum solo as a lot of people see them as an excuse to go to the bar, no so here. The quality of the dvd is as good as to be expected, given the limited budget. Multiple camera angles capturing the on stage action, and the editing is surprisingly good, giving each band member equal time throughout each song. However what this dvd is good at, is showing the band at its raw, grittiest best, you can certainly see the passion this band have and the belief in their music. A potent live dvd, highly recommended. The track listing and running order are the same for the cd and dvd, however the dvd has a Bonus feature- “Behind The Scenes With Absolva” with on the road footage, travelling to Belgium, setup, sound check, as well as behind the scenes and an interview with Chris.